What makes this game different? How fast a computer do I need? How do I join a game of MegaTF? Problems? Click here for help! How do I join a Chat Room? The abbreviation 'MegaTF' stands for 'Mega Team Fortress'. If you've ever played Quake, Doom, or Unreal, you've played a first person game. 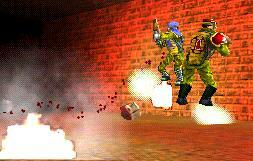 MegaTF is based on the quake engine. It is somewhat similar to these types of games, but is much more than just shooting at enemies. In MegaTF, you can set traps, place proximity grenades, plant timed bombs, heal your allies, repair teammates armor, call for airstrikes, ignite your jetpack to fly, use a grappling hook to scale walls, create ammo dispensers for yourself and your teammates and build sentry guns to obliterate your opponents. MegaTF requires much more than fast reflexes. It's all about teamwork and out-thinking your opponents. There are nine 'Classes' or 'Character-Types' in MegaTF. Every player has the choice of being either a Scout, Sniper, Soldier, Demoman, Medic, Heavy Weapons Guy, Pyro, Spy, or Engineer. Each of these classes has their own weapons, skills, and abilities. For example: the Scout is a very fast class with a jetpack that allows him to fly, while the Heavy Weapons Guy is very slow, but has a lot of firepower. Each class is different, and each class will be have advantages or weaknesses against against different other classes and weapons. Working together, the different classes can form a rock-solid defense or an unstopable offense. Every MegaTF game is a contest between teams, usually a red and a blue team. As a member of one of those teams, your job is either to defend your flag, (by killing the ememies coming to take it) or to capture the enemy flag (by killing those guarding it). It's all up to you which you decide to do, and which class you choose to do it with. Once you've picked a class and a team, you'll quickly realize that MegaTF is a capture the flag game. Your team has a flag which you need to defend, the other team has a flag which you want to capture. To capture the enemy flag, fight your way to the enemy basement, and touch the flag. It will attach itself to you automatically, and will remain attached until you die. That's the easy part. To complete the capture, you need to make it out of the enemy base alive and bring their flag back to the "Capture Point" in your base. When your team captures the enemy flag, everyone on your team will get 10 points. If they enemy captures your flag, they will all get 10 points. At the end of the game, the team that has the most total points wins. Since you get one point for each kill, you may be tempted to play "just for frags", trying to kill as many people as you can while ignoring both your flag and the enemy's flag. While this will boost your score, it's not typically what experienced players do. Those who want to give their team the best chance of winning the game will either try to capture the enemy flag, or will defend their own. I've played games like Quake. What makes MegaTF so different? There is no other game like MegaTF. It's much more complex than a simple shoot 'em up. Everyone who has played MegaTF long enough to understand the basics will tell you its the best game they've ever played. The most action. The most challange. The most fun. Period. Give it a try, and before long I bet you'll feel the same way. Players range in age from under 10 to 40+. Many young adults play MegaTF, but the game appeals to an older audience too. It's not all about shooting (which can get boring) - there's much more to this game. My computer isn't the best, can I play MegaTF? Yes. Another advantage of MegaTF is that you don't need a powerful computer to play. Many of the newest games need very powerful computers to be enjoyable. With MegaTF, almost ANY computer can play the game at a high level of performance. Owners of powerful computers can take advantage of them and play MegaTF in a visually enhanced mode, but many players use older computers to play.